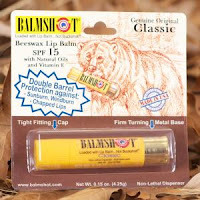 BALMSHOT-Loaded with lip balm...Not Buckshot! The elves are Wrapped Up N U are from the south. If there are a few things that are true about us southern elf's, it's that we LOVE our mama's, sweet tea and hunting! 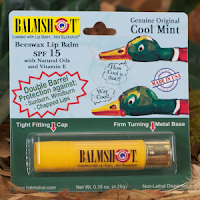 So when we reached out to Balmshot for our holiday gift guide we were very excited to work with them. Not only did we like the look of their product, we also were delighted with the customer service they offered. It's not very often that we reach out to a company and get an email back from the president. When our box arrived we could not get other the cute factor...yep it's a southern thing! Regardless of the container it's in this lip balm is just the bees knees! What we like most about this lip balm is that it's not heavy or sticky. It goes on smooth and easy. In the south, we would say-It spreads like butter. The 2 yellow shells are made with beeswax with other natural oils and vitamin E. The 2 pink shells are made with Ozokerite with Aloe and Vitamin E and are PABA free. All 4 have a rating of SPF 15 to help protect your lips from sunburn, they also protect from windburn and chapped lips. For all these reasons alone we think Balmshot would make the perfect stocking stuffer for everyone this holiday season and we think Santa would agree! Look for them at these retailers or buy online. 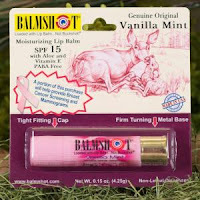 BALMSHOT offers 4 unique lip balm varieties in our collection; Classic, Cool Mint, Pure Pink and Pink Camo. As an added bonus, BALMSHOT makes a quarterly donation from the proceeds from every purchase of Pure Pink and Pink Camo lip balms to the Mountain States Tumor Institute to help needy women pay for mammograms, biopsies and breast cancer treatments. Wayne S. Forrey, the company's founder and product inventor, contracted lip cancer in 1983 due to his outdoor lifestyle and frequent sunburned lips. After successful lip reconstruction surgery, he began using lip balm everyday to protect and moisturize his lips. Wayne became dissatisfied with industry standard lip balm dispensers because the knurled disk base would twist and rotate in his pants pockets...thereby mashing the balm into the cap...making a gooey mess. Many people told Wayne they experienced the exact same gooey mess. To solve this problem, Wayne went to his garage and invented a much better lip balm dispenser system including a firmer twist base and tighter fitting cap. BALMSHOT was the result of this innovative effort, and a new Idaho company was born in 2010. We focus much of our charitable giving in Idaho and other western states. We are an annual sponsor of the Shoot for a Cure event to fight breast cancer. 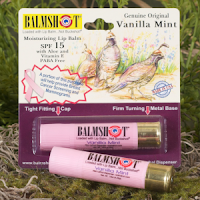 Proceeds from the sale of every Pure Pink and Pink Camo BALMSHOT product are donated quarterly to the Mountain States Tumor Institute to help needy women pay for mammograms, biopsies and breast cancer treatments. We also participate in a job sharing program with the Deseret Industries organization. A disclaimer and disclosure: * I received one or more of these product in exchange for a review. I was compensated with product for my reviews, however, all my opinions are my own, based on my personal experience with the product. I am disclosing this in accordance with the Federal Trade Commission’s 16 CFR, Part 255: Guides Concerning the Use of Endorsements and Testimonials in Advertising.